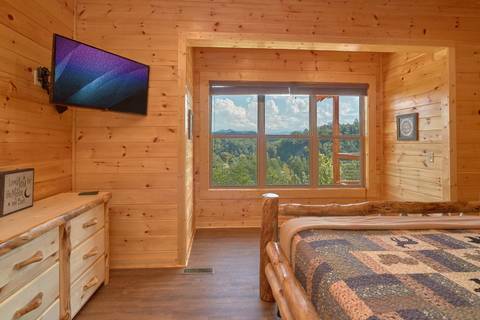 ***Brand New Cabin Opening October, 2018! 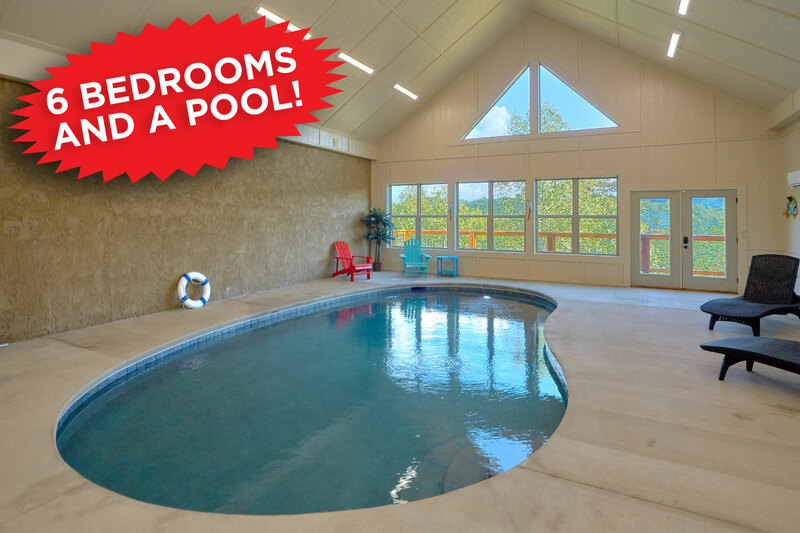 A great choice for family reunions and large groups of friends, "A POOL WITH A VIEW" is sure to feel just like home... That is if home has its' own indoor swimming pool, a theater room, a pool table, video games, huge covered porches, 6 bedrooms, 6 bathrooms, sleep up to 20 people and has an unbelievable view of the Great Smoky Mountains National Park! 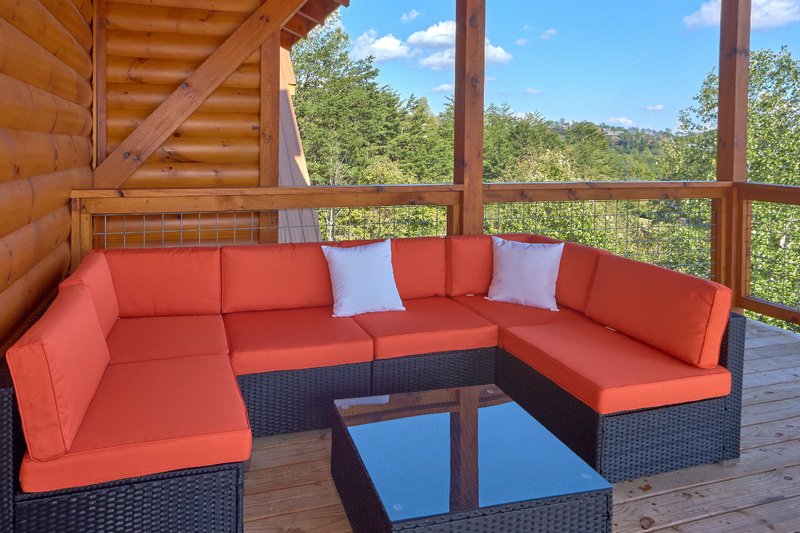 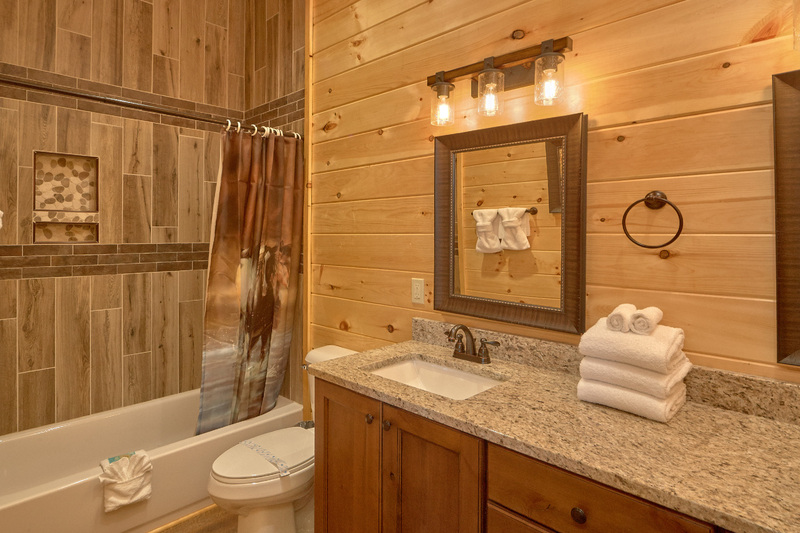 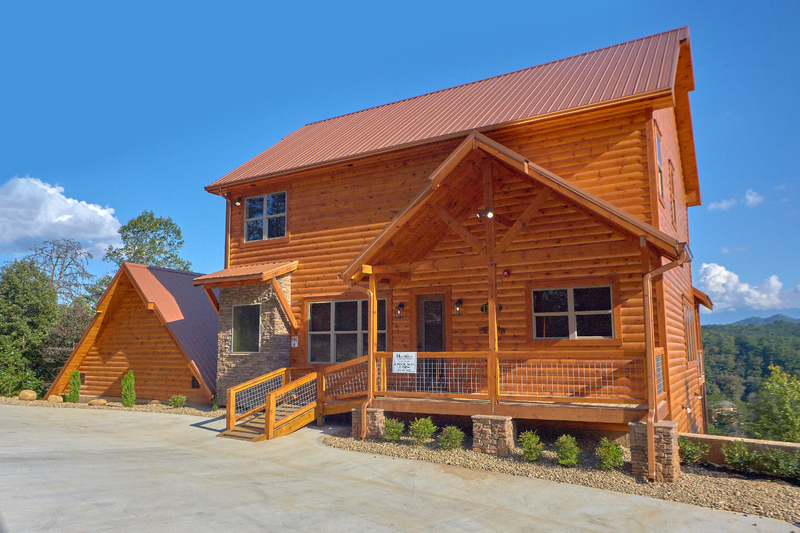 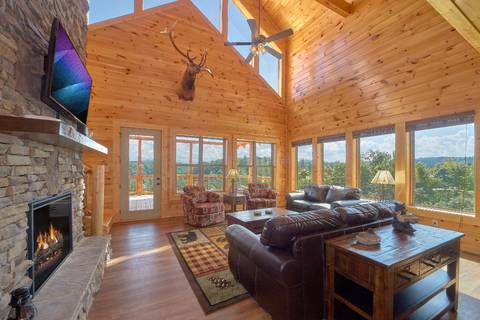 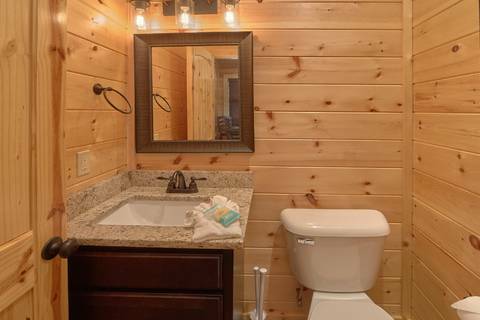 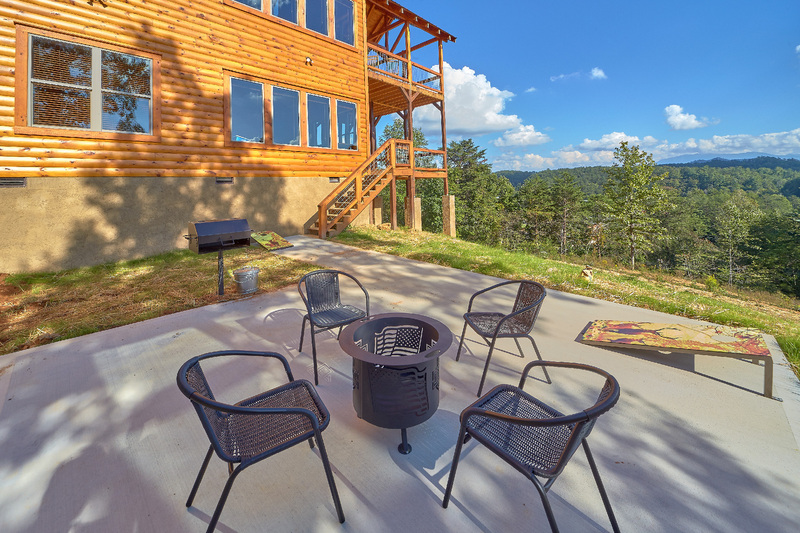 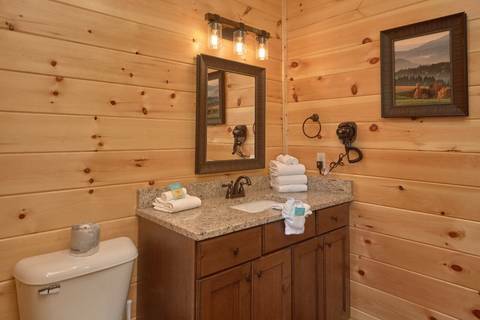 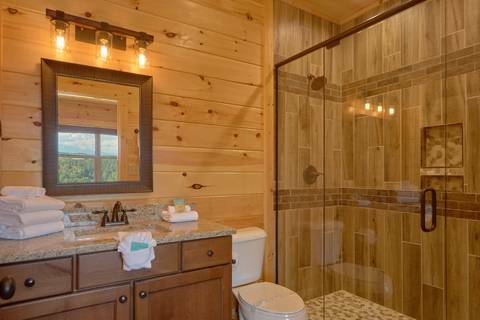 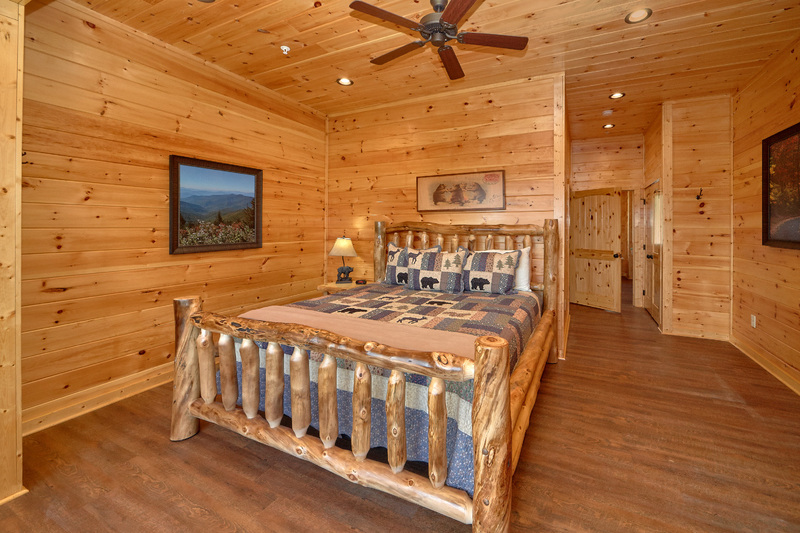 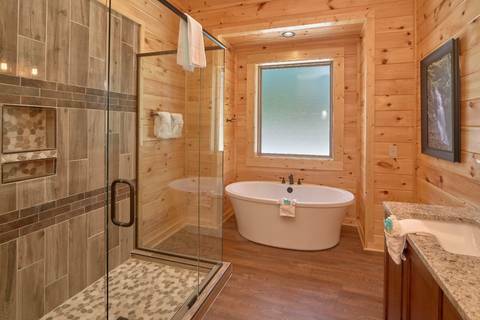 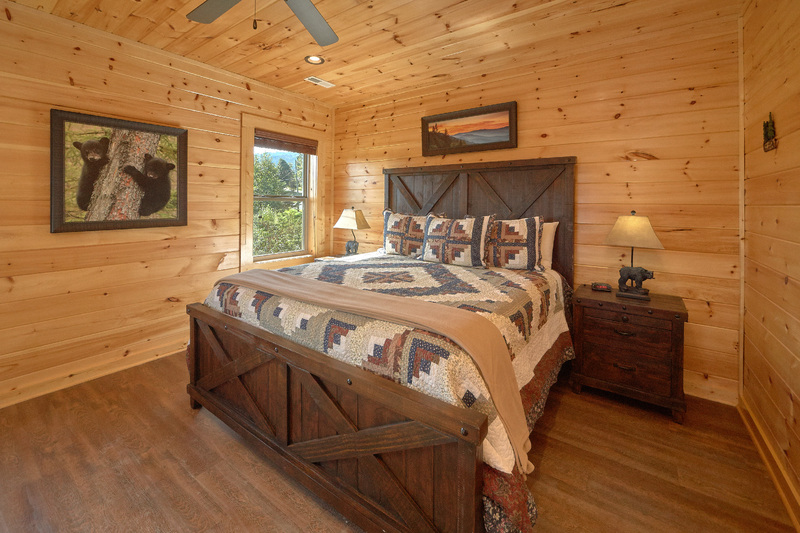 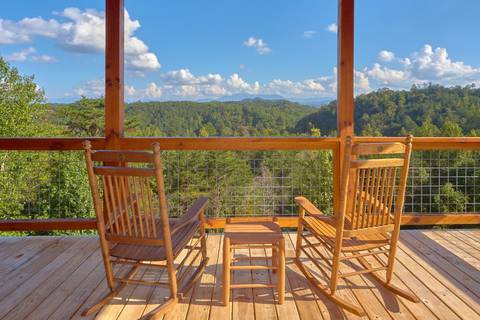 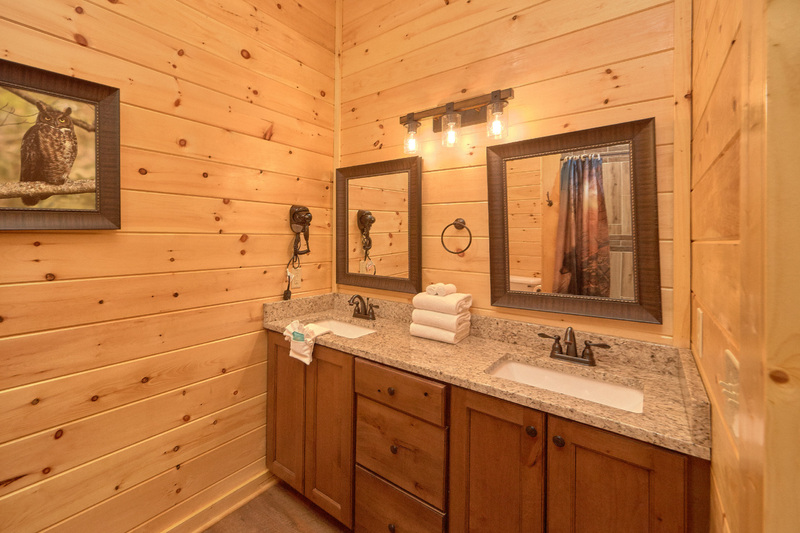 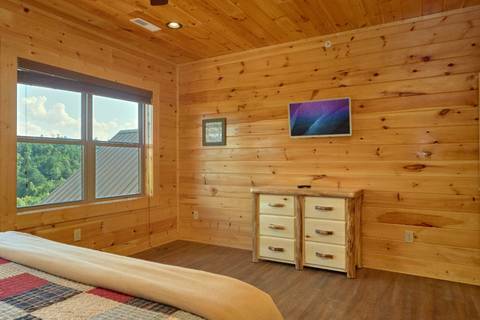 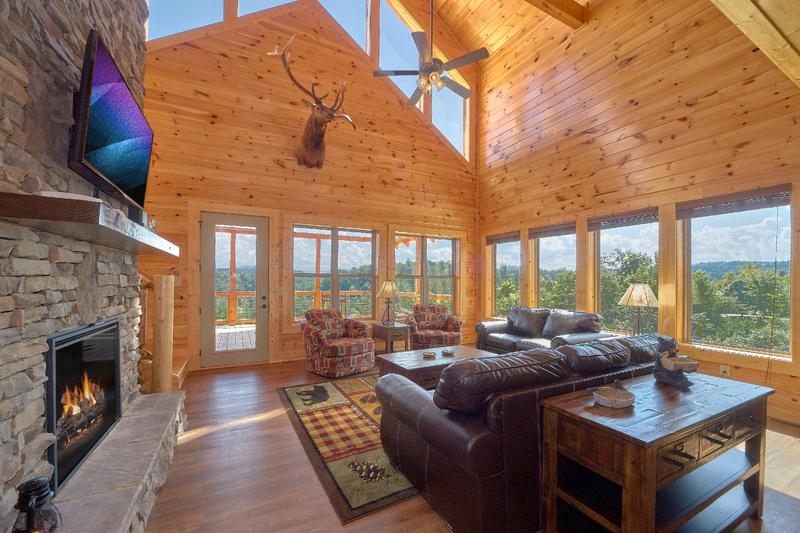 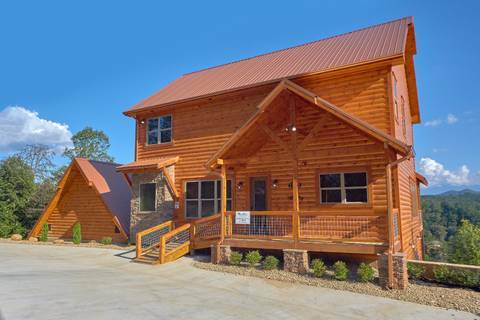 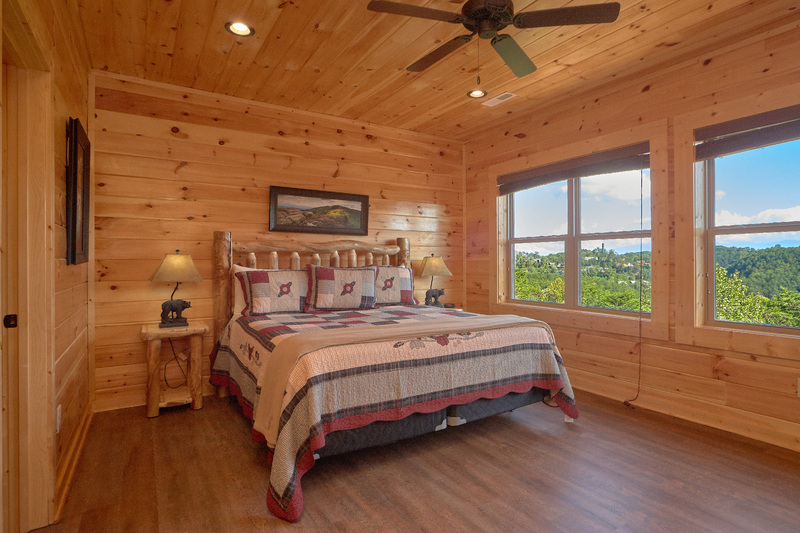 Reserve now and be one of the first to stay in this wonderful luxurious log cabin. CABIN LAYOUT: Step in the entry level of this beautiful cabin into a large open layout. 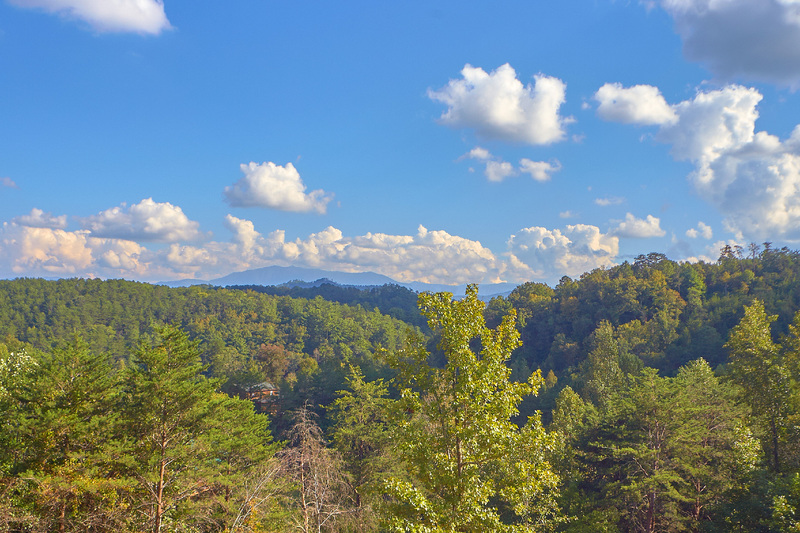 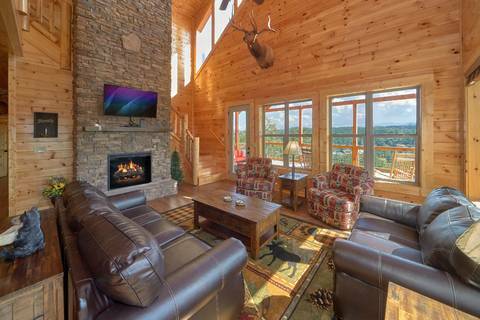 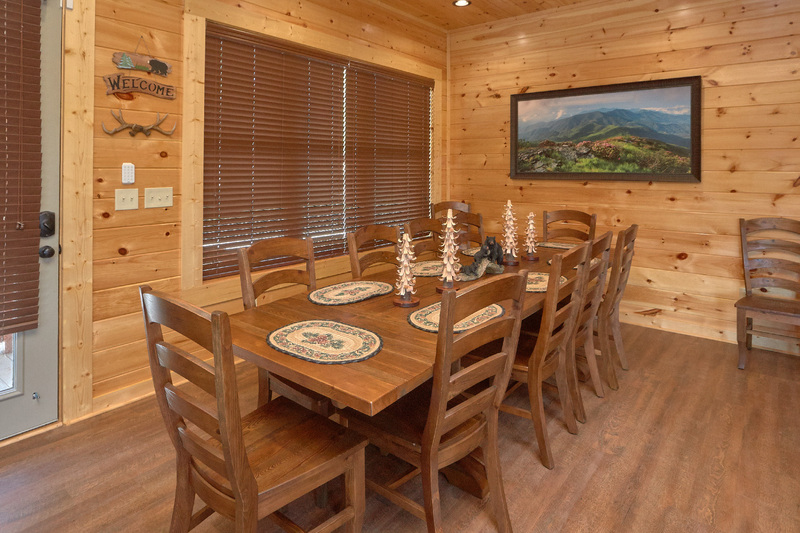 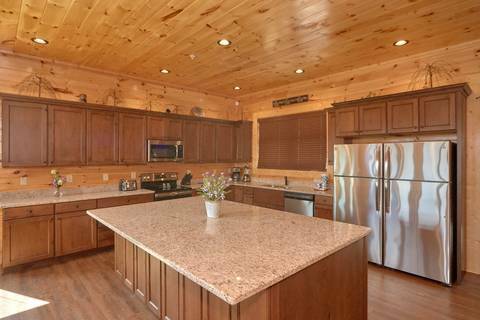 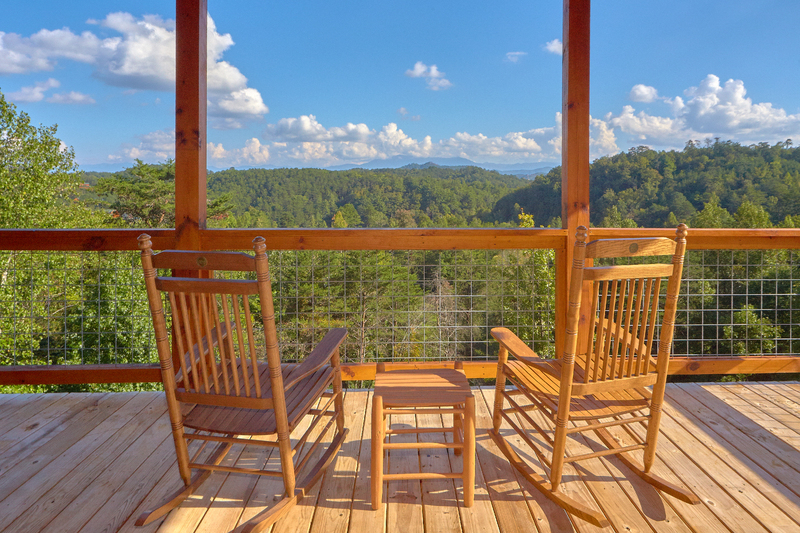 The kitchen, dining room and living room will greet you and you'll know that you have picked the perfect place for your trip to the Smokies! 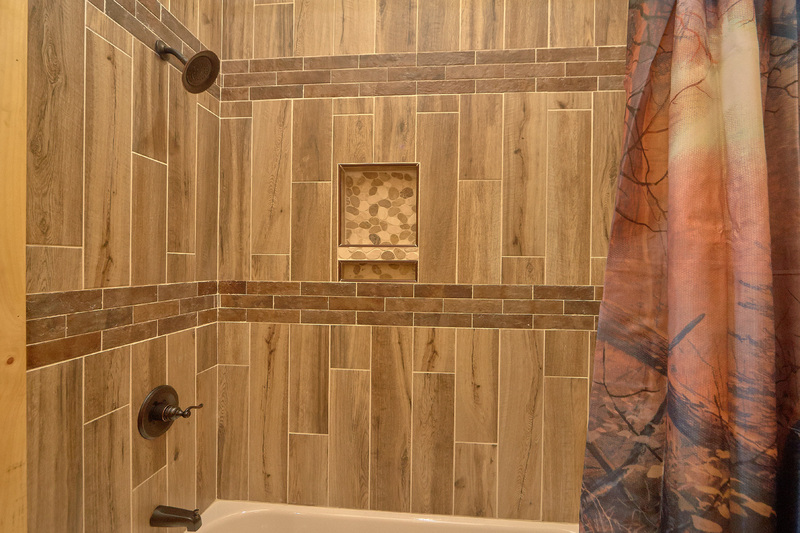 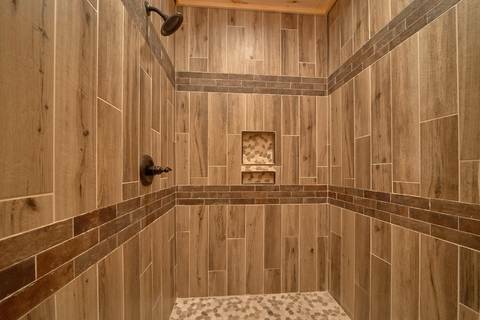 Wood flooring, the gas fireplace and the large chandelier are just the beginning. 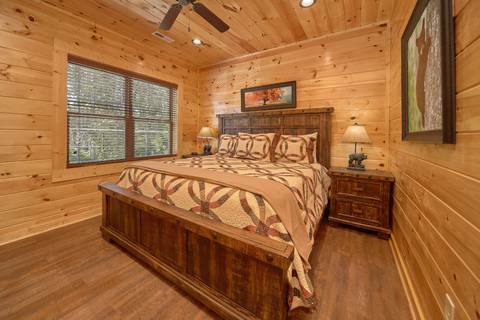 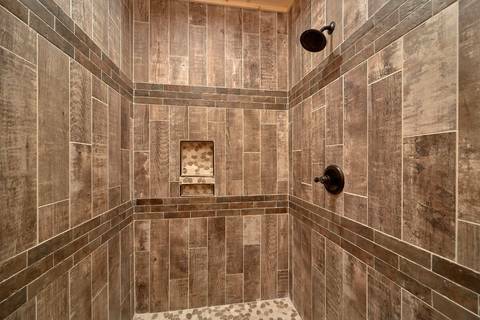 A master bedroom with a king sized bed and a full master bath can be found on this level. Add in a sleeper sofa in the living room and this level sleeps 4 people. UPPER LEVEL: The upper level is loaded with bedrooms. 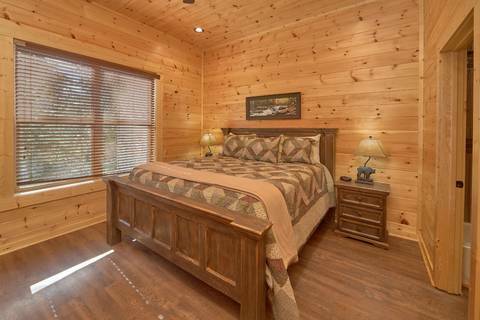 3 bedrooms featuring King-sized beds and full bathrooms. 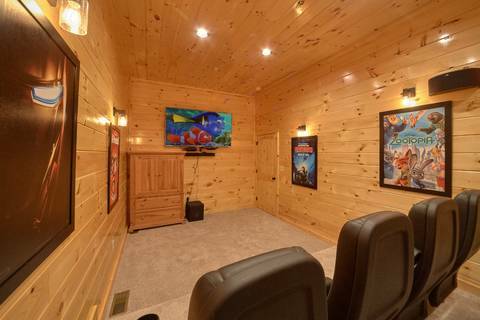 Plenty of closet space in each room as well. This level will sleep 6 people. 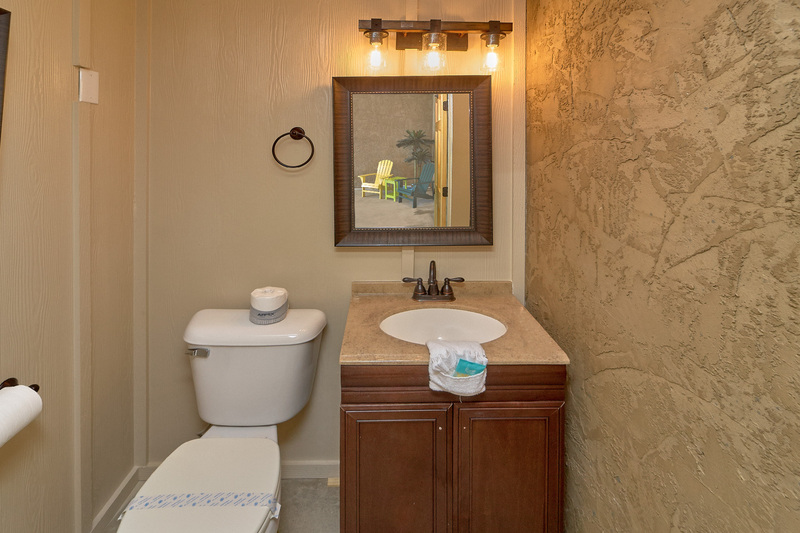 LOWER LEVEL: Downstairs features all kinds of fun! 2 more bedrooms, each with it's own bathroom. 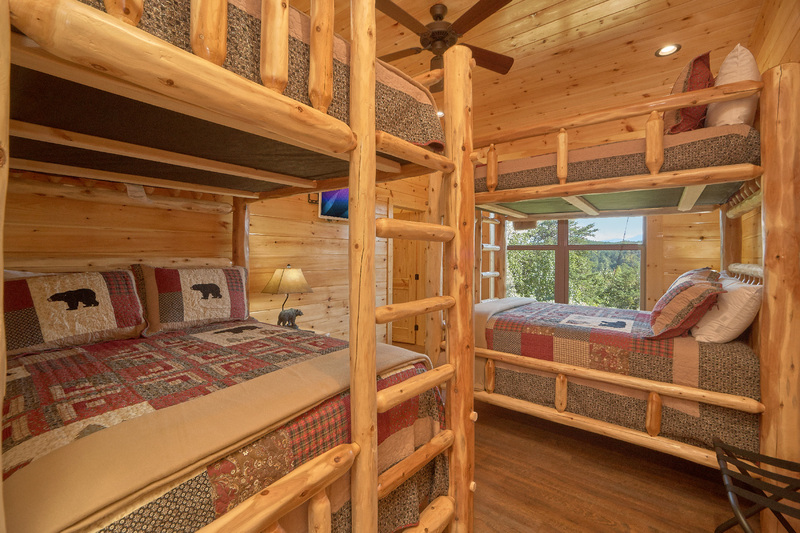 One bedroom features a king-sized bed and the other is a bunk room with 2 sets of full-sized bunk beds. Sleeping capacity on the lower level is 10 people. 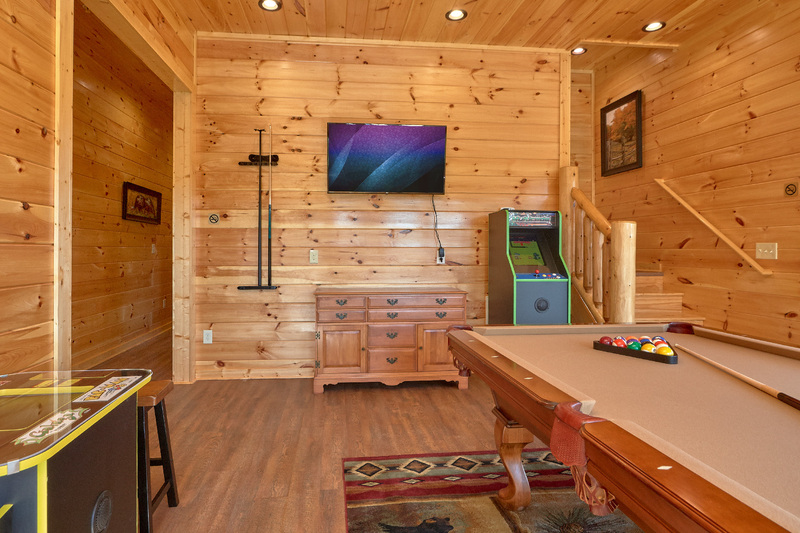 There is an entertainment room with a fantastic pool table and a multicade video game, featuring all of your 80's arcade classics! 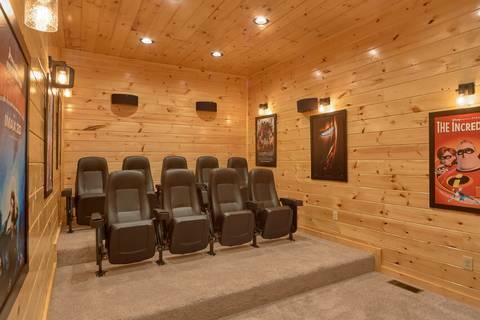 The theater room is just that, a full blown movie theater room with a huge HD TV, digital surround sound and theater seating. 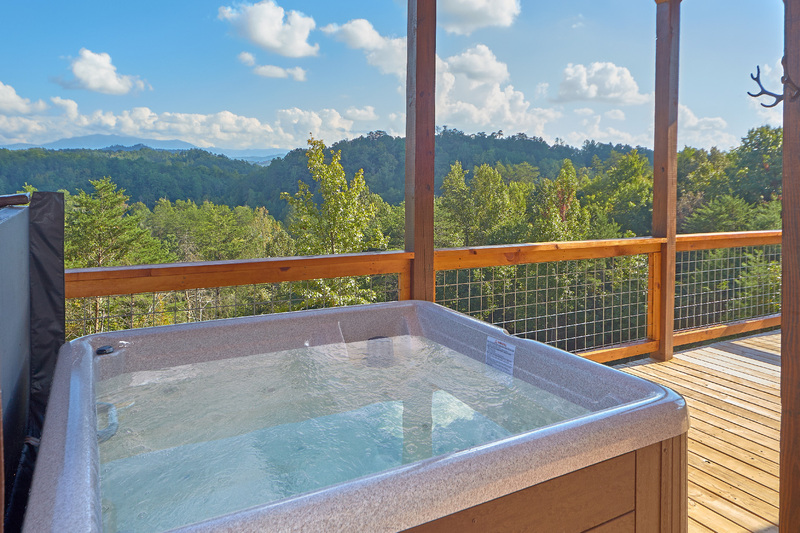 The covered porch is perfect for relaxing, especially from your own bubbling hot tub. 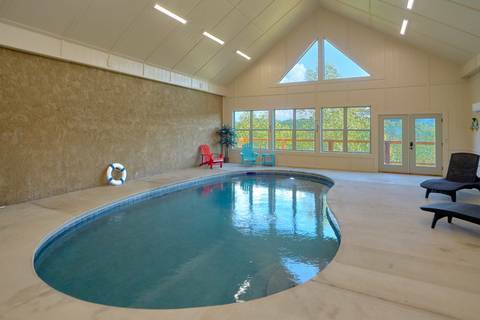 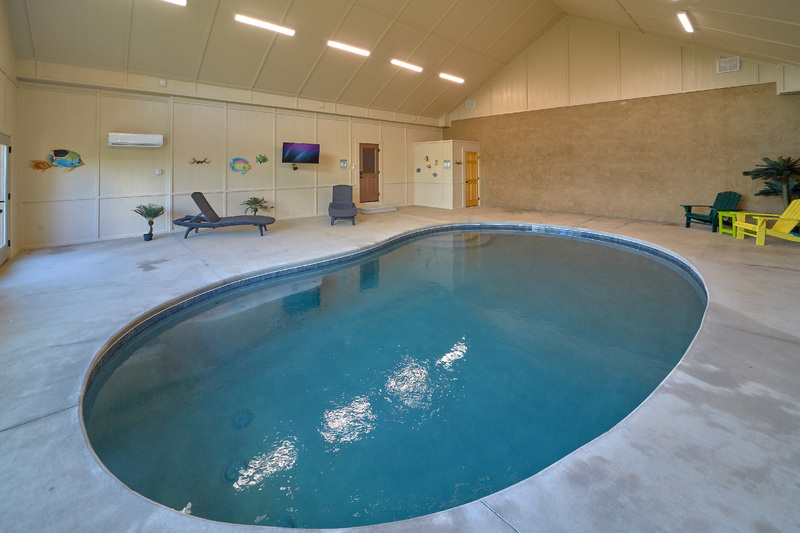 Finally, a full indoor salt water swimming pool can be found on this level! This cabin has it all! Hurry, this place will book up quickly! The reservation guarantee is 7% of your total reservation and enables you to receive a full refund, less the cost of the guarantee, up to 15 days prior to your arrival for a 1 to 5 bedroom cabin, and up to 60 days prior to arrival for 6 bedrooms and larger. 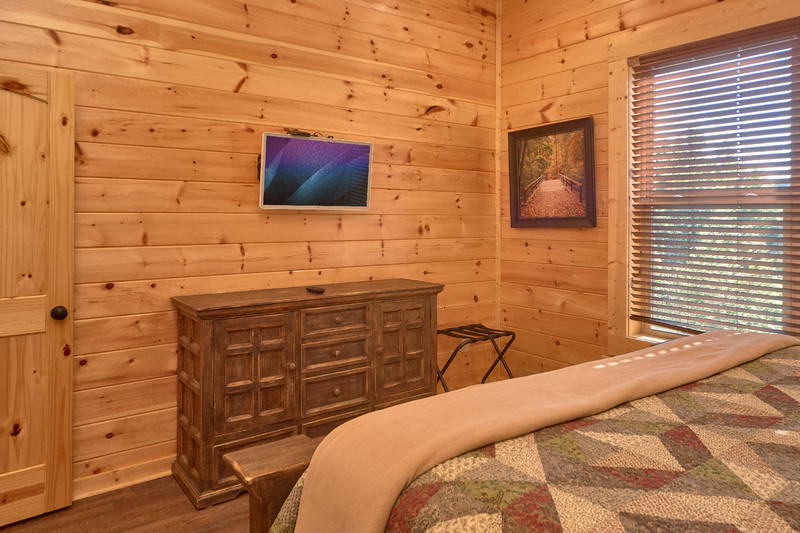 Once inside those time periods the reservation guarantee would allow you to reschedule your stay. 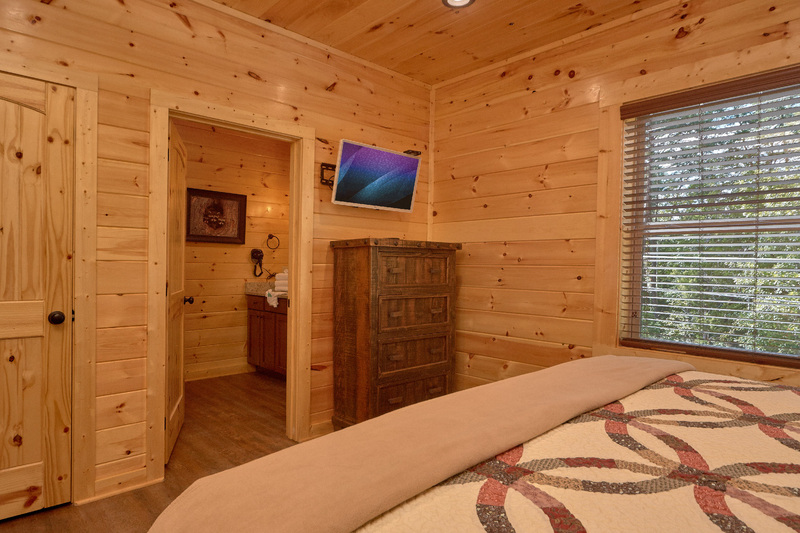 Though the deposit guarantee is an optional charge, Hearthside has a no refund/no reschedule policy without it. 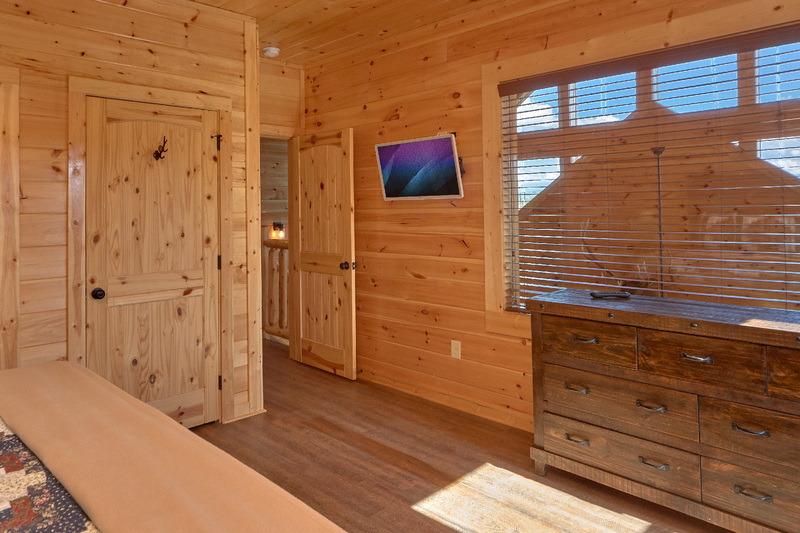 *Rescheduled stays will have 6 months to come and must stay in the original cabin booked.